While Chris O'Leary's music is rooted in the blues, you can hear shades of New Orleans, rockabilly and more in their big, high-energy sound. Several years ago, Levon Helm joined in on some of Chris's early recording sessions, and then sat in on O'Leary's regular gigs. Soon, Levon asked Chris and his compadres to join the house band at his club in New Orleans. Chris spent the better part of a year at the club as a focal point of Levon Helm's Barn Burners, backing up touring stars and opening for New Orleans' finest players. 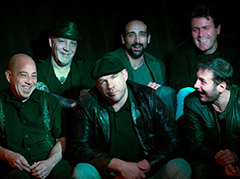 In 2007 O'Leary formed a new band, including fellow Barn Burner Frankie Ingrao on bass and guitarist Chris Vitarello.